During my second trip to the Omo Valley just two weeks ago I was lucky enough to visit the Dasanech people of Omorate. A short crocodile infested river crossing in a cut out canoe, and a walk along a barren landscape brought me to a tiny village. It was over 40 degrees centigrade and the wind was blowing the dusty earth into my eyes. An abandoned wooden structure, once serving as a church, stood alone away from the village, serving as a constant reminder of a hostile environment. The dwellings where perhaps the biggest surprise. Where once stood picturesque thatched huts now huts made of corrugated iron had taken there place. The women seemed desperate in their attempt to beg for money or sell crocodile teeth caught by their husbands. Whilst talking to the locals I met a young girl who’s beauty seemed to contrast heavily against the unsightly surrounding. 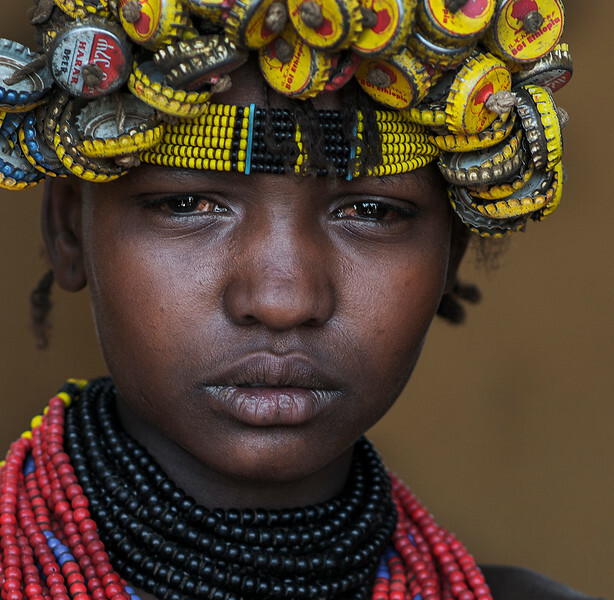 Her head gear made of bottle tops drew my attention. As beautiful as she was there was sadness in her eyes. The marks on her face and the blisters on her lips a clear sign of the hard life these people must endure.